On the morning of 27th November 400 officials – police, army and representatives of Indonesia’s state-owned airport developer PT Angkasa Pura I – arrived to survey land for New Yogyakarta International Airport (NYIA) in the Temon District in the Kulonprogo Regency, on the south coast of central Java. An attempted land grab for the airport, and the courageous resistance of residents resisting forced eviction is documented in a video by Jogja Darurat Agraria. In the space of just two days bulldozers have wreaked devastation reminiscent of a powerful earthquake that struck the island of Java in 2006. Parts of some houses have been destroyed and trees and plants uprooted leaving bare earth. The land does not belong to PT Angkasa Pura I and residents are refusing to leave or to sell their property. Officials, some of them armed with guns, inform the residents that they will register their houses and instruct them to vacate, and that they have been instructed to clear the land, to tear down everything, by 4th December. But 300 residents are refusing to sell the land passed on to them by their ancestors. Their livelihoods depend upon the farming that they are determined to continue, their values embedded in the culture and nature of the southern coast area. Women play a prominent role in resisting the forced eviction for the new airport, they stand their ground against the intimidation of large numbers of male officials, facing down heavy verbal aggression, refusing to obey commands, refuting claims that the airport is for their economic benefit and asserting their right to remain in their homes. A crowd of officials confront another woman on her doorstep, try to push the door down, shout at her to get out and try to force their way into her house. She shouts out to the officials that their role is to protect civilians. Then some men begin to wrench open the door. Another woman, also confronted by officials at her door, says that they told her that received three warnings of the impending eviction, she denies this and insists that she did not receive any warning. Officials are shown cutting off the electricity supply to some of the houses. This move is intended to amplify the threat of destruction and make other residents give up their resistance to eviction, dismantle their homes to salvage whatever they can, and vacate the area. Jogja Darurat Agraria posted photos on Facebook showing villagers gathering to witness and resist the bulldozers at work and the severing of electrical supplies. The Indonesian government’s attempt to evict Kulon Progo villagers from their homes and farmland at this particular time, beginning on 27th November 2017, adds irony to insult and intimidation; 29th November is designated by the United Nations as the International Day of Women Human Rights Defenders. A video posted on 28th November shows distressed residents – women, men and children – bravely standing and lying in the path of the bulldozers as roofs are ripped off houses and trees uprooted. They are dragged away by officials. Cutting off electricity supplies continues. The new airport is a key project of the Indonesian government, led by President Joko Widodo, which is pushing for accelerated infrastructure development. PT Angkasa Pura I claims that the process of land acquisition and clearance for NYIA is under control. In reality a land grab is taking place. Forcible eviction for the airport is a shameful and serious abuse of human rights and the very opposite of the government’s stated commitment to achieving the United Nations Sustainable Development Goals (SDGS), specifically SDG 11: Make cities and human settlements inclusive, safe, resilient and sustainable. The struggle against eviction for New Yogyakarta International Airport dates back to 2011. The site comprises six villages, 2,875 households with 11,501 residents, most of whom sustain agricultural livelihoods cultivating many crops in the fertile soil, including watermelons, chillie peppers and eggplant. Construction of the mega-project commenced and continues without approval of an Environmental Impact Assessment (EIA) and there are serious concerns that destruction of sand dunes will make the coastline more vulnerable to erosion and flooding. An aerotropolis around the airport is planned, a 2,000 hectare ‘airport city’ containing hotels and other tourism facilities, shopping malls and industrial zones. Authorities have perpetrated repeated acts of repression and violence against villagers resisting displacement for NYIA, which, in its pre-construction phase, was referred to as Kulon Progo Airport. The worst incidence occurred on 16th February 2016. Police and army officers overseeing a boundary-marking procedure subjected a number of residents who had gathered to voice their objections to a vicious and brutal attack. People were choked, kicked and trampled on. The case was taken up by the Asian Human Rights Commission which condemned the excessive use of force and called for prosecution of the officers who were in charge of the exercise. GAAM has contributed a short article about aerotropolis projects to the Spotlight Report on Sustainable Development 2017: Reclaiming Policies for the Public. The report, by the Reflection Group, a global alliance of civil society organizations and networks was launched on 10th July and is being discussed at the High-Level Political Forum, the United Nations’ central platform for follow-up and review of the 2030 Agenda for Sustainable Development. 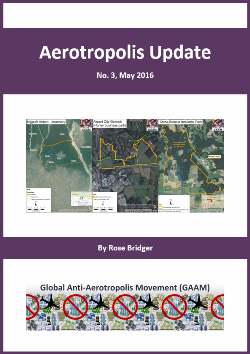 The GAAM article The ‘Aerotropolis’ phenomenon – high risk development thwarting SDGs was written by Anita Pleumarom, coordinator of Tourism Investigation and Monitoring Team (t.i.m.-team) and appears as a box on page 115 in chapter 11, which relates to SDG (Sustainable Development Goal) 11, to Make cities inclusive, safe, resilient and sustainable. The SDGs, 17 in total, a set of goals to end poverty, protect the planet, and ensure prosperity for all as part of a new sustainable development agenda, were adopted by countries on September 25th 2015. Each SDG has specific targets to be achieved over a 15 year timeframe, by 2030. The Spotlight report assesses the implementation of the 2030 Agenda, analyzing systemic problems in its realization. Governments recognized the essential role of the public sector, including public finance, in achieving the SDGs. But this role is being undermined by privatization and public-private partnerships (PPS), which have strengthened the grip of corporate power on people’s lives. GAAM’s aerotropolis article outlines how this new form of airport-centric development, driven by a combination of private business interests and state control and spreading rapidly worldwide, works against achieving progress towards the SDGs, as it ‘profoundly subverts the goal of building inclusive, equitable cities’. The report provides a breadth and depth of information to help enable civil society to reclaim public space, and measures that governments should undertake to establish the requisite regulatory and global governance framework.